Home → Blog → Solterra Resort Villas in Orlando | Everything you need to know including directions! 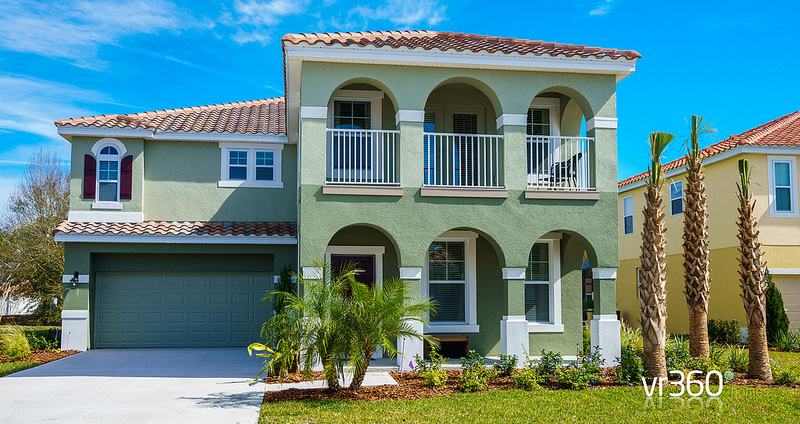 The Solterra Resort has quickly become one of our most popular Orlando villa communities. Mainly due to the size of the homes and the location of the community. The Solterra Resort villas also tend to be on larger lots than other nearby new rentals so that little bit of extra space is great. Another big draw is the Solterra Resort clubhouse which has recently had a new lazy river added (opened summer 2017). The Solterra clubhouse already had a great communal pool with a water slide, hot tub, fitness room and lounge area. There are also tennis courts which are free to guests and a kids play area. Updated March 2018: The clubhouse is open daily from 8am - 11pm and the fitness center is open from 5am - 7pm to onsite guests. They are also added a pool side cafe which is now open. This will now make the Solterra Resort facilities feel like an actual resort as the name suggests. We will be visiting the Solterra Resort again in May 2018 to take some new photos of the lazy river, poolside restaurant and anything else we think you would like to see. We will also get a copy of the restaurant menu and opening times as well as trying some of the food, we can't recommend a place if we haven't eaten there! Solterra is now a 24/7 gated community, for the first few years the gates were there but always open, they are now manned 24/7. We have Solterra Resort villas and vacation rentals to suit all guests from 4 - 9 bedrooms, that can sleep 8 - 18 . We have single and double storey villas available as well as townhouses. As of September 2017 there is still some building work going on but they are building the community in phases so this shouldn't effect the current Solterra Resort villas we have listed. The location is fantastic being just minutes from Champions Gate and Interstate 4 (I4). Being close to I4 gives you quick access to all of the theme parks, Orlando International airport and the Gulf coast and Atlantic beaches. We are constantly adding new Solterra Resort villas as they are finished so keep checking our website for updates. We will also post them on our Facebook page as they are added. More than likely you will be driving to Solterra Resort via Interstate 4 so below are the very simple directions from Interstate 4. We have also added driving direction from Orlando International Airport, Sandford and Tampa airports so you won't get lost after a long flight. East Bound: Take I-4 Exit 55 and go south on Highway 27. Turn right on Heller Brothers Blvd. Then right on Ernie Caldwell Blvd. Then left on Pine Tree Trail. Solterra Resort will be on the right. West Bound: Take Exit 58 at Champions Gate. Go right on Champions Gate Blvd. Turn Left on Ronald Reagan Parkway and then right on Pine Tree Trail. Solterra Resort will be on the left. The Solterra Resort is located just off HWY54 in Davenport and is close to Champions Gate, Posner Park and Reunion. Each of these areas has shops, supermarkets and restaurants so you are never far from anything. For shopping head to Posner Park as this is the nearest shopping mall which also has a brand new cinema. Other nearby places include Celebration which has lots of restaurants and independent boutiques. Great place for lunch and a walk around the lake. You are also not far from HWY192 which is the main road that links Davenport to Kissimmee and has hundreds of shops, restaurants and other attractions. Below is a list of Orlando attractions and how far away they are from the Solterra Resort. These are actual distances to the car parks rather than to the edge of the Disney property which is how most people quote times. We want to give you a realistic time, Disney has a 30 square mile site so once you reach the edge of the property you can still have a 10 minute drive to get to the car parks. We have also included Busch Gardens in Tampa. Just click on the links below to load google maps on your smart phone and hit start on the directions to use a sat nav. There are lots of golf courses near the Solterra Resort but here are just a few that I would recommend. You can normally book on there personal websites or by calling the pro shops which is sometimes best if the weather is looking a bit unsettled. If you book online you can't normally cancel, but if call and book over the phone they don't normally ask for payment upfront. If the weather is looking good also check www.golfnow.com as they often have last minute Hot deals and you can get some very cheap rates. We will be adding more posts shortly with everything you need to know about the local area. You will then have all the information you need for your next stay at the Solterra Resort. If we have missed out anything you would recommend to guests staying on the Solterra Resort please leave a comment below. We think you will find the Solterra Resort is a great place from which to explore all the Orlando theme parks and attractions.